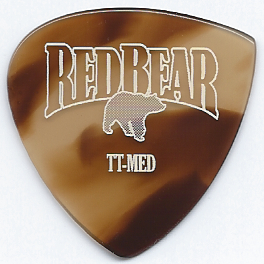 Red Bear Trading Company has been making fine hand-crafted guitar picks since 2003. - Our picks have become world-renowned for the feel, tone and performance they offer. 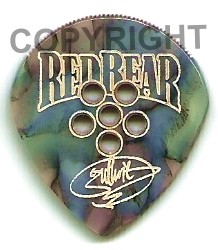 - Red Bear's Original line of flat picks provide smooth string attack and release - literally gliding off the strings without effort. - Players of all styles agree, ours are simply the best guitar picks available today. The Guthrie Govan Signature Model will be available on Friday, May 9, 2019 starting at 10 AM MT in our Royal Blue and Black Cherry colors. Please Check our online store for Current Offerings. Our picks are made from Galalith also referred to as Milk Stone or Avoriolina (Ivory imitation). This natural product is made from the hardening of casein, the protein of milk which is a “polymerized animal protein”. Using this material for flat picks delivers an organic feel imitating the warm tone and feel of real shell from the Hawksbill Turtle which is now a protected species. Many people who have tried our picks cannot tell them apart from the real thing. Our picks may be copied, but never equaled! DO NOT be fooled by the imitators. 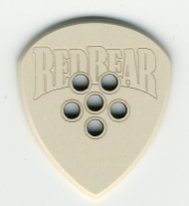 Red Bear Trading Company IS THE original manufacturer of these fine picks. For information about the Guthrie Govan pick please follow this link. 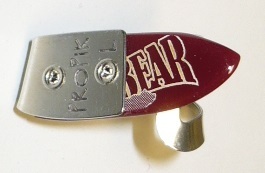 Red Bear makes two style of thumb picks – the Bear Claw© which is made from our Tuff Tone material and the “Original” which is made from our traditional original material. Simply click this link to order or go to our Thumb Picks page for more information. These picks are a less expensive alternative to our standard line. They deliver great tone while possessing unbeatable strength and warp-resistance. They require absolutely no special care. Keep them in your pocket, wash them, toss them around - nothing hurts them. This material is offered in a buff color and in two gauges which are specific to the Tuff-Tone line: Medium (1.25mm) and Extra Heavy (1.80mm). ALL RIGHTS RESERVED WORDLWIDE 2016 and beyond RED BEAR® TRADING CO., LTD.